ZOMBIES: ARE THEY GOOD FOR THE JEWS? Now Brad Pitt’s summer movie spectacular, World War Z, has the world wondering: are zombies good for the Jews? “Next year in Jerusalem!” zombies pray. The film, loosely based on the book by Max Brooks (Mel and Anne’s son; who knew?) chronicles the advent of a planet-threatening pandemic of zombies, fast-moving voracious creatures with one overriding purpose: to replicate their kind. Once a zombie bites a human, the victim goes into convulsions and, within seconds, becomes a zombie himself, with the same unnerving appetite. And so their number increases exponentially. Brad Pitt plays Gerry Lane, a former UN employee. His past experience is not clearly defined, but whatever he did, it brought him to places like Kosovo, Chechnya, and Liberia, so we know right off the bat that he’s an expert on Seriously Bad Stuff. When the zombie menace hits America (eliminating the federal government and downtown Philadelphia), Lane’s former UN boss calls him back into service. His mission is to track down “patient zero,” in the hope that uncovering the source of the pandemic will unlock clues about a cure. Lane is a reluctant hero. He would rather stay with his family, safely ensconced on an aircraft carrier in the North Atlantic. But when told that refusal will mean the return of his family to Philadelphia (a city now bereft of brotherly love … or brothers), he has no choice but to accept. The mission takes Lane to South Korea, site of the first reported case. There, at a US military installation, he meets a mentally unhinged ex-CIA agent, who tells him that only two countries have figured out how to stop the menace: North Korea and Israel. The North Korean government has accomplished this miracle by implementing a nationwide dental extraction program, a remedy which could work only in a police state respecting neither freedom of speech nor freedom of teeth. Lane decides he’d rather take a closer look at the Israeli solution. Against a backdrop of proudly fluttering Israeli flags, Lane arrives and meets Jurgen Warmbrunn, an avuncular Mossad chief, who explains why Israel, alone among the nations, took the zombie menace seriously. The Holocaust, the Munich Massacre, the experience of nearly being overrun in 1973 – all these have convinced his people that no evil is beyond possibility. So when nine experts deem a danger unimaginable, the Israelis appoint a tenth man to imagine it – and to figure out a countermeasure. Warnbrunn is that tenth man. His solution to the zombie menace? To build a gigantic wall around Jerusalem. Nowadays, the politically correct term for the barrier Israel built to protect its citizenry from terrorist attacks is the “Apartheid Wall.” So any movie that treated an Israeli separation wall as necessary– well, as Jews say at Passover, “dayenu!” It’s enough. 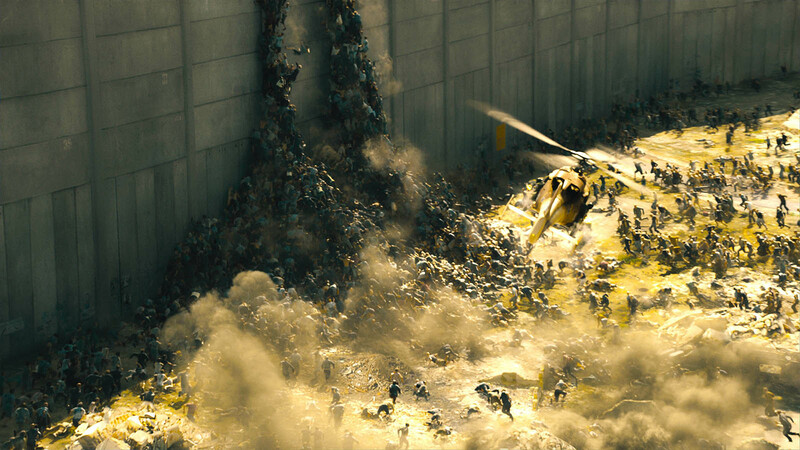 But World War Z goes beyond accepting the wall as necessary. In the movie, the wall is a symbol of brotherhood. Lane sees that Palestinians are allowed entry. Warnbrunn explains: “Every human we save is one less zombie to fight.” The Israelis are not only prescient enough to recognize the zombie threat, they are munificent enough to recognize their common humanity with the Palestinians. But these same virtues carry the seeds of destruction. At a checkpoint in the shadow of the wall, Lane witnesses Haredim, secular Israelis, and Palestinians happily singing, celebrating diversity, or whatever people celebrate when they’re glad that they haven’t been chomped on by zombies. Handsome Israeli male soldiers and foxy Israeli female soldiers stand guard. This Kumbya moment creates a cacophony of joyful noise. Sadly, it turns out that zombies are attracted by noise. They mass in their millions outside the city, hurling themselves against the wall, creating a teeming rampart of zombie flesh, which eventually rises up to and over the top of the barrier. Zombies overflow into the citadel. Israeli soldiers fight valiantly, but the zombie tidal wave inundates Jerusalem. Recognizing that Lane is critical to the survival of humanity, his Israeli guards do all they can to get him to the airport. One even adopts the terrorist tactic of blowing himself up with a hand grenade, to destroy as many of the zombies as possible and to buy time for Lane to get out. Ultimately, it comes down to Lane and one last soldier, the brave, beautiful Segen. Fighting their way out the Jaffa Gate, Segen sustains a zombie bite to the hand. Lane quickly appraises the situation. A sudden knife thrust, and Segen has lost her hand and Lane has saved her life. The desperate pair barely make it onto the last plane out of Israel. The nation is lost, but Segen survives. For the rest of the movie, she stays with Lane, playing a key role in his mission. The American and Israeli work to save the world together, hand in hand. But not literally. So, now back to the opening question. Are zombies good for the Jews? Purists might point that the question is inapt. Israel and the Jews are not synonymous. Portraying one favorably doesn’t necessarily signify anything for the other. But it’s clear that the movie means to conflate the two. When Warmbrunn, the Mossad chief, explains the origin of the tenth man concept to Lane, he cites the Holocaust, an event that predated Israel. It is the Jewish experience with horror that equips them to foresee and prepare for the zombie menace. As with all profound questions, there are arguments on both sides. Here’s a scorecard. YES. Zombies are good for the Jews because they demonstrate that when a global pandemic hits, it’s a good idea to listen to Jews. They know what’s going on, and they have good ideas on how to deal with the situation. NO. If Jews are so smart, then why is the Jewish State destroyed? North Korea survives — and how many Nobel Prizes have the North Koreans won? YES. Zombies bring out the best in Jews, allowing them to show their universal love for mankind. YES. Zombies strengthen the ties between the United States and Israel. All-American Hero Brad Pitt gains vital information by visiting the Jewish State. His alliance with Segen, the beautiful Israeli soldier, proves critical to his mission. NO. But Brad Pitts cuts off her hand. That’s a pretty obvious metaphor for the United States insisting that Israel curb its military. Hey, who the hell wrote this movie, Peace Now? YES. True, but you can tell Brad Pitt really likes Segen. That signifies warm U.S.-Israeli relations. NO. Sure, he likes her. But he never acts on it. He remains faithful to his shiksa wife. YES. Give me a break. She’s missing a hand. NO. So, you watch Game of Thrones, don’t you? Jaime Lannister became attractive to Brienne of Tarth only after he lost his hand. If the United States really cared for Israel, Brad Pitt would have at least tried to kiss Segen, hand or no hand. Are zombies good for the Jews? World War Z poses the question but never really answers it. Little wonder. The issue is almost Talmudic in its complexity. But the success of the movie has led to reports that Paramount is planning a sequel. This post was good for me. Reincarnation is not dead. Mark Twain is alive and well in the form of the “To Put It Bluntly” blogger. Thank you for this contribution to my holiday weekend. Only a National Lampoon alumnus could come with something so simultaneously twisted, funny and articulate. Excellent explanation of the movie but without a comment as to whether it is worth seeing. What do you think? Larry, this was brilliantly funny. One of the best pieces that you have ever written. I laughed, I cried, I almost died from a busted gut. More film reviews with a Talmudic twist.